The combination of paclitaxel and FOLFOX led to an improvement in progression-free survival (PFS) compared with FOLFOX alone among chemotherapy-naïve patients with advanced gastric cancer, according to results from the phase II FNF-004* trial presented at ASCO GI 2019. Eighty-nine patients with advanced gastric cancer who were chemotherapy-naïve and with an ECOG performance status of 0–1 were randomized to receive either FOLFOX alone (2-hour infusion of oxaliplatin 85 mg/m2 plus calcium levofolinate 400 mg/m2 followed by 46-hour infusion of fluorouracil 2,400 mg/m2 [initial fluorouracil bolus 400 mg/m2]), paclitaxel plus FOLFOX (3-hour infusion of paclitaxel 135 mg/m2 plus FOLFOX regimen without fluorouracil bolus), or FOLFOX plus intraperitoneal paclitaxel (3-hour infusion of intraperitoneal paclitaxel 80 mg/m2 plus FOLFOX regimen without fluorouracil bolus). Patients received up to nine cycles of treatment, then capecitabine until disease progression. Overall survival, though immature, also showed a trend towards improvement with the combination of paclitaxel and FOLFOX (9.534 vs 6.641 months, HR, 0.729, 95 percent CI, 0.400–1.328; p=0.300) and FOLFOX plus intraperitoneal paclitaxel (10.882 months, HR, 0.583, 95 percent CI, 0.303–1.122; p=0.102). Response rate was better among patients who received paclitaxel plus FOLFOX compared with FOLFOX alone or FOLFOX plus intraperitoneal paclitaxel (complete response: n=4, 2, and 2, respectively; partial response: n=13, 9, and 9, respectively), though the greater response rates seen with paclitaxel plus FOLFOX was not significant compared with FOLFOX (p=0.121). Neutropenia was the most common grade 3–4 adverse event in all treatment groups (30.0, 34.5, and 33.3 percent of patients on paclitaxel plus FOLFOX, FOLFOX plus intraperitoneal paclitaxel, and FOLFOX alone, respectively) followed by diarrhoea (13.3, 20.7, and 13.3 percent, respectively). Three patients in the paclitaxel plus FOLFOX arm experienced grade 3–4 sensory neuropathy compared with one each in the FOLFOX plus intraperitoneal paclitaxel and FOLFOX alone arms. According to the researchers, while doublet regimens are a common treatment for advanced gastric cancer in East Asia, triplet regimens are recommended in Western countries, with some controversy as to which regimen is preferable. 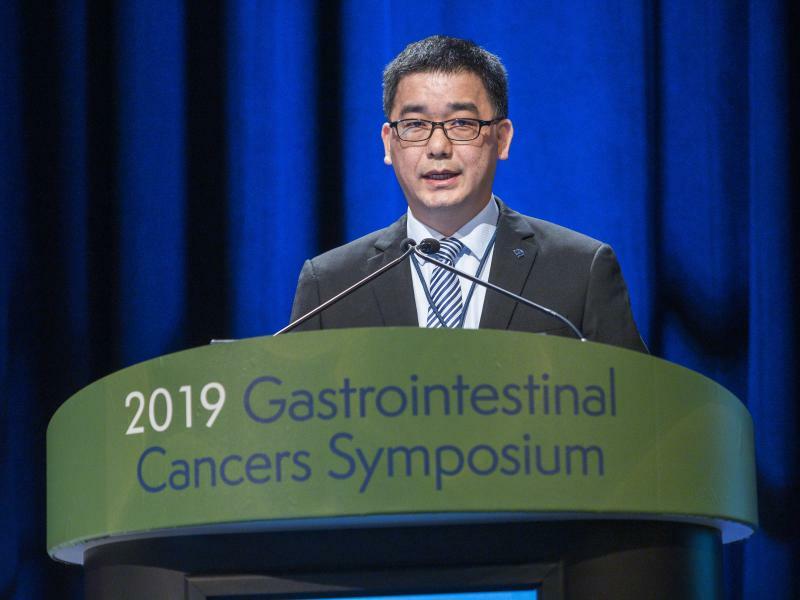 Clinicians are usually reluctant to prescribe the triplet regimen as there is a high toxicity rate as well as little survival benefit, said Dr Rongbo Lin who presented the findings. “[This study showed that] both paclitaxel plus FOLFOX and FOLFOX plus intraperitoneal paclitaxel improved survival compared with FOLFOX [alone],” said Lin. “[However], only paclitaxel plus FOLFOX, and not FOLFOX plus intraperitoneal paclitaxel, improved response rate compared with FOLFOX [alone],” he said, pointing out that the addition of paclitaxel, be it intravenously or intraperitoneally, did not significantly increase toxicity in these patients.